Louella Breckenridge was born in Farmville, Virginia on June 21, 1918 to the late Collin and Martha Bagley. She departed this life peacefully on Friday, March 22, 2019. Louella moved to Red Bank, NJ at an early age. She worked as a housekeeper and became Certified as a Nurse's Aide from Riverview Medical Center in Red Bank, NJ. 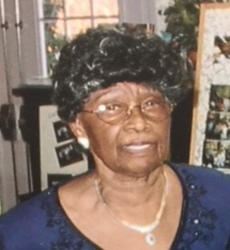 She served as a faithful member of Pilgrim Baptist Church in Red Bank for the past 76 years. She was a past member of the Bible Study Program, Flower Club, Willing Workers, Assistant Sunday School Teacher, Supervisor of Senior Red Circle, Missionaries and Vacation Bible School Ministry. Louella is predeceased by her husband, John Breckenridge, her brothers William and Richard Bagley, her sister Elizabeth Hopson, son Robert Biddle and stepson Carl Davis. She leaves to cherish her memories a son Charles Biddle (Janet), Richmond, VA; daughter Ann Wilson (Barry) Tinton Falls, NJ; step-daughters Deborah Patin, Green Brook, NJ, Linda Sams (Willie), Miramar, FL, Jeanne Reed Asbury Park, NJ; one brother Jack Bagley, New York, NY; God-daughter Tiffany Mewborn (Marcel), Neptune, NJ; God-son David Hundley, Petersburg, VA; 13 grandchildren, 21 great-grandchildren, 11 great-great grandchildren and a host of nieces, nephews and other relatives and friends. To the Breckenridge family and my friend Ann Wilson. You all have been so blessed to have your mother for 100 years. Truly blessed from our faithful God! Celebrate her home going because she is with her heavenly father. My prayers are covering you!